Prime Day, the manufactured holiday by Amazon.com to mark the site’s 20th anniversary on July 15, 2015, was the biggest day of the past year for Amazon.com…by far. Experian Marketing Services’ Hitwise® online intelligence tool reports that Amazon.com garnered over 83.3 million visits from mobile and desktop browsers on Prime Day. By comparison, Prime Day topped Cyber Monday — the previous record holder — by a staggering 51.5 percent and Black Friday by 77.2 percent. 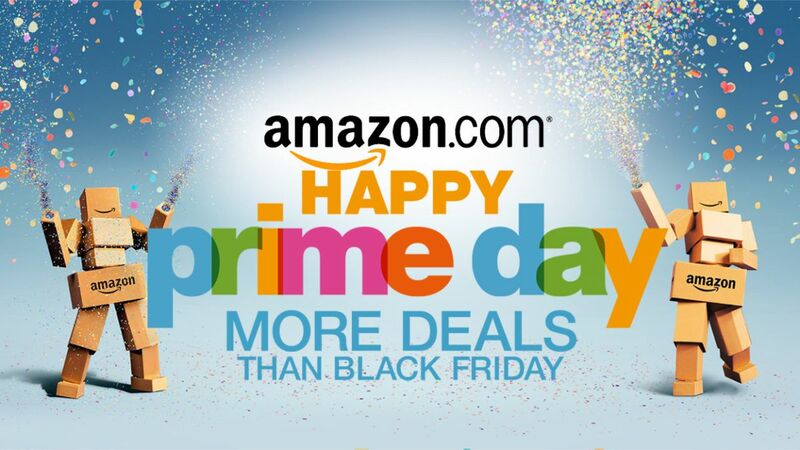 It’s actually a bit ironic that Amazon promoted Prime Day as having more deals that Black Friday. That’s because visits to Amazon.com have actually been growing so steadily that last year’s Black Friday isn’t even among the site’s 10 biggest traffic days of the last 12 months. Nearly half of the days in July this year, in fact, have had visit counts that surpassed Black Friday. 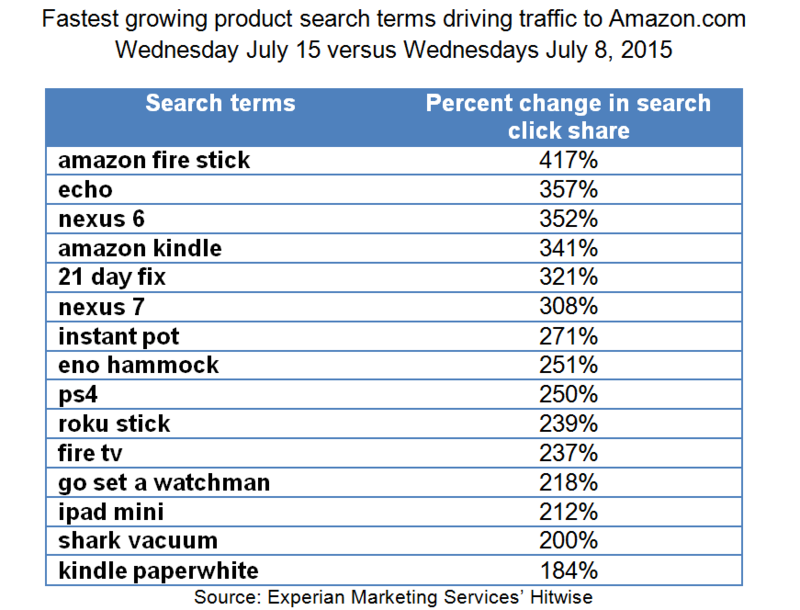 Compared to the previous Wednesday (July 8), the number of visits to Amazon.com on Prime Day rose 68 percent. But Amazon wasn’t the only retailer celebrating. Prime Day was definitely more of a “a rising tide lifts all boats” kind of event. 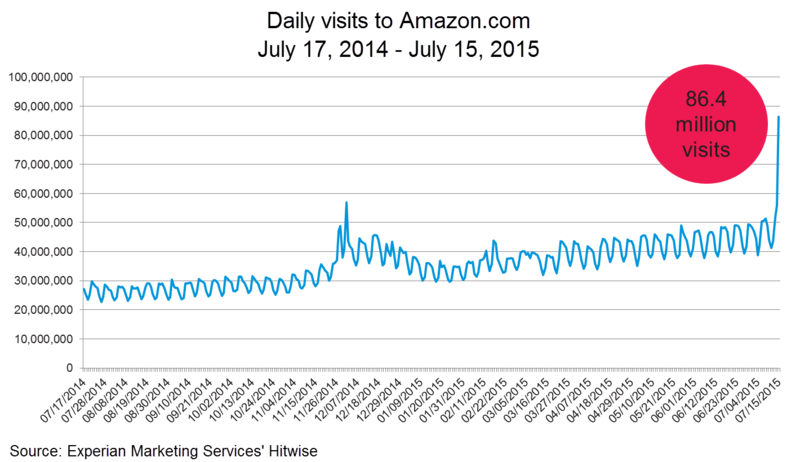 For instance, 57 of the top 100 retail sites in the Hitwise 500 also saw increased visits on July 15 compared to the Wednesday prior. Walmart and Best Buy, which offered competing deals, had a an especially strong showing on Prime Day with visits to their sites up 97 percent and 44 percent, respectively, over the previous Wednesday. So what deals were consumers flocking to Amazon.com to take advantage of? To find out, I used Hitwise to compare the search terms leading to Amazon on Prime Day compared to the previous Wednesday. No surprise, many of the products that had the greatest increase in search click share week-over-week were Amazon’s own, including the “Amazon Fire Stick” (+417 percent) and “echo” (+357 percent). But also on the list were other products that were part of Amazon’s celebratory deals, such as “Nexus 6” (+352 percent), “Instant Pot” (+271 percent) and “PS4” (+250 percent). Overall, searches for Amazon Prime Day and variations thereof were common on July 15 and Amazon.com received 59.8 percent of search clicks from “Amazon Prime Day” searches, 61.2 percent of which were paid, meaning Amazon invested heavily in making sure that it successfully captured the traffic of interested consumers. But obviously not all Prime Day searches lead to the retail giant. Media sites Wired, CNNMoney.com and NBC News each captured at least three percent of traffic following a Prime Day search. In fact, seven of the top 10 winners of “Amazon Prime Day” searches were news and media outlets, which largely did not invest in paid search for that term. In terms of sources of traffic to Amazon.com, News and Media sites accounted for a 56 percent greater share of upstream traffic on Prime Day (6.7 percent) than the previous Wednesday (4.3 percent). But media weren’t the only ones talking about Prime Day, consumers, too, were taking to social media to chat up the event. And while not all online chatter was positive, Social Media sites delivered 15.2 percent of all referred traffic to Amazon.com on Prime Day, up from 11.3 percent of traffic the Wednesday prior, a relative increase of 35 percent. Despite the fact that Prime Day was meant to celebrate a milestone anniversary for Amazon, the overwhelming success for Amazon and other retailers will likely make it an annual event. If that is indeed the case, consumers will come to anticipate the day much like they do Black Friday. Marketers shouldn’t discount the potential for an annual Prime Day event to disrupt normal consumer spending patterns as well as drive even more dollars to be spent through online channels. For more information on how you can leverage Hitwise, the world’s largest sample of online consumer behavior, to improve the effectiveness of your search, display, affiliate, mobile, email and social media marketing campaigns, click here.